Written by Dominik Joe Pantůček on December 6, 2018. Basic computer vision algorithms may aid you in performing visual control of whatever you may be manufacturing. But if you want something more, you need to turn to the magic world of … linear algebra. Read on to see how all those little vectors and matrices help us with QA. Even though our testing devices are equipped with camera of extraordinary resolution, it is not wise to rely on extremely precise positioning of the PCB holder and the camera arm. 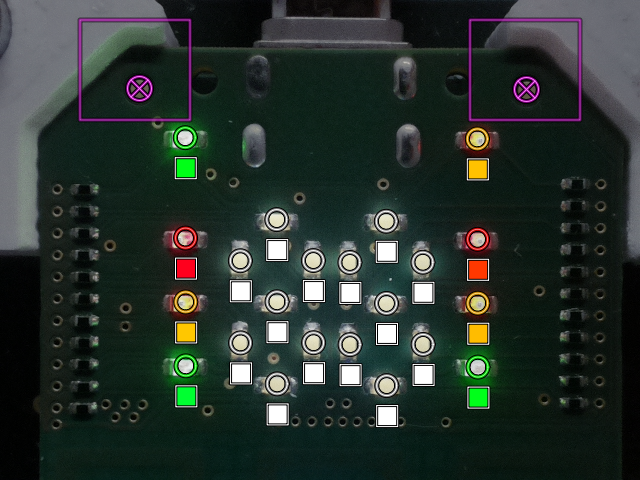 Therefore we have a special aiming markers – consisting of concentric circles – on our PCB and using computer vision algorithms we find their centers. Of course, the circle finding algorithm – as mentioned last week – may find more circles depending on the lighting conditions. Yet as the algorithm knows where about to find the markers, it can easily discard false positives and we have their positions in camera coordinates. And we know that we need to rotate the coordinate system so $\Delta’$ holds given angle $\beta$ with the X-axis. We actually need to align the vectors $\Delta$ and $\Delta’$ directions and these angles just help us thinking about that. So $\alpha$ is the angle between $\Delta’$ and the X-axis and $\beta$ is the angle between $\Delta$ and – again – the X-axis. If we rotate everything by $-\beta$ and then by $\alpha$, we get the required alignment. Yes, there are few tricks involved I did not show you – but you can easily derive them yourself. For example there is no need for calculating the sizes of $\Delta$ and $\Delta’$ – therefore you can save calculating the square roots there. The resulting transformation can be pretty fast and can be performed in real time even on a slower computer. You can see the accuracy in Picture 1 below. The program is – of course – not just a simple coordinates transformation. There is also color-space transformation in place which helps us check the intensity and correct color of every LED soldered. Thank you for staying with us and I hope we have proven we take the quality control seriously. Come back next week for more!